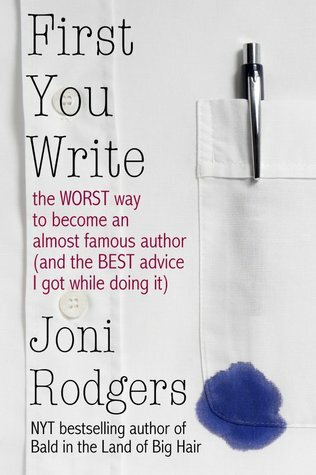 It's 2:00AM and I just finished Joni's excellent book on the profession of writing. Being a Newbie, newly published Author, http://www.amazon.com/The-Audubon-Cap..., I can relate to her story.We all go through highs and lows in our lives. It's how we cope with those events. Joni copes well and knows how to get in the FLOW of writing. It took me 12 years to get my book published. First I had to get Govt. approval - two years ago and then I had to write it - not an easy task - I wasn't a writer. That's what I thought then. I proved myself wrong.Now what do I do? FIRST YOU WRITE showed me ways to go, which I appreciate and will follow. The book deserves a second reading - next weekend. I'll be writing my second novel: The Three Wives of Don Quixote Smith. Maybe I'll go HYBRIDIZED. My first was published by Black Rose Writing. I recommend this book to all Newbies. I'm not an advice book person, but I thought there was some good advice in this. I was drawn more to the memoir portions of the book and about her life as a ghostwriter. I also really liked the end, with a bunch of advice from a bunch of a different writers. Since writing Bald in the Land of Big Hair Joni Rodgers has become a very successful author, with best-selling fiction and non-fiction to her credit. She has also made a successful career out of ghost writing, which she make fascinating in this book. This isn't a book on how to write, it's a book on how to get published and maintain a career. Of course, being Joni she uses amusing anecdotes to illustrate her points, but there are serious moments, too and she's always entertaining. This is a book I got on a whim.It's an unashamed look a publishing and why this author writes--and it resonated within me. Joni Rodgers is unapologetic about the choices she's made and recognizes the good, the bad, and the ugly turns in her life. Her life and the curve balls she faced were staggering. But what saved her was the love of a man she wasn't sure she stay with (and did!) and the love of the written word.She reminded me why I write, what I love about it and ultimately, I am in charge of my career. I may not always agree with her outlook on some things (which is fine-because we are all different in our experiences)but what I do connect with is her journey to why she writes, what she loves, and how hard she continues to do so.I recommend this for all writers--because this publishing buisness is sobering and at times its hard to remember why one started down this road. It is a quick read, but well worth it. I don't know where I heard about this book, but this lady can write. This was a memoir about a woman who wanted to get a book published. She succeeded, but also had cancer, and she also got successful at ghostwriting. She learned a lot about herself and a lot about the publishing industry. She talks about the ups and downs, in an easy to read way. At the end she raves about the way publishing has changed so that now anyone who wants to write a book can via Indie publishing. I don't know if i made this book sound as good as it was. It was a quick, interesting read. This isn't a fluffy book about connecting with your inner muse or doing exercises. It's an honest, spunky journey from juvenile scribbler to NYT bestseller to one of the pioneers in the vanguard of the indie publishing movement. Whether you're pushing against boundaries in publishing, banging your head on a wall of writer's block - or just curious about how writers 'do it', Joni's frank story is sure to enlighten, inspire and entertain. Of the many thousands of books written about writing, I'd say this book comes in just about last.